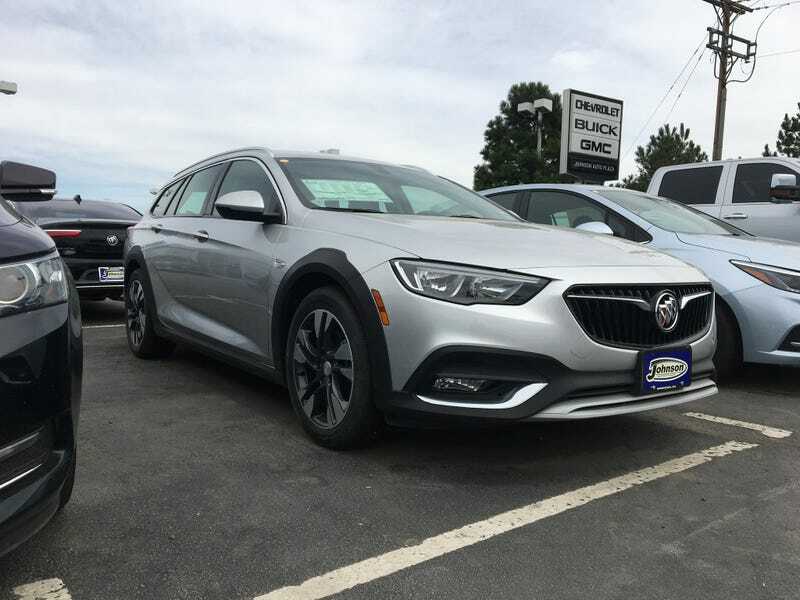 This was an Essence trim level Buick Regal TourX. To be honest, I didn’t realize that they sported a Regal badge on the back. It really is a looker in person. Walking around the entire vehicle, I really liked it. Then, I got inside. It looks like a pleasant place to be in photos. It’s comfortable, the leather seats fit me well. It’s also a quiet place to be. However, the fake stitching on the dash (it’s molded rubber/composite material) doesn’t fool anyone. It looks cheap, and it feels cheap. Overall, it felt like the inside of my Focus ST, except my Focus was a helluva lot cheaper new. Things I’ll forgive in a car that cost me a tick over $19k with rebates, I’m not willing to forgive in a car pushing $40k. The salesman admitted to me that they’ve only sold 1 of these so far. Check out the row of blank switches for the “top of the line” car. To be fair, this one did not have a sunroof. I expected driving impressions to hopefully outweigh my disappointment with the cabin. They didn’t. It’s quiet, it moves, and that’s about it. It’s not a quick car, but not snail slow, either. As I told my son, the TourX made me feel like a I simply in a car. For people that need point A to point B people mover that has gobs of space in the back, I think it’s a perfectly reasonable choice. I say that having not driven an Outback yet. I had an Altima rental car last summer that I would choose over this. There’s a dealer nearby that has a couple of similarly equipped demo cars with around 1500 miles on them. They’re marked $10k off sticker. I’m not even tempted to go look at them. Buick gets an A+ for design from me, but a C in execution. And that’s being generous. It’d a shame because I really expected to like this car, and potentially come home with one.